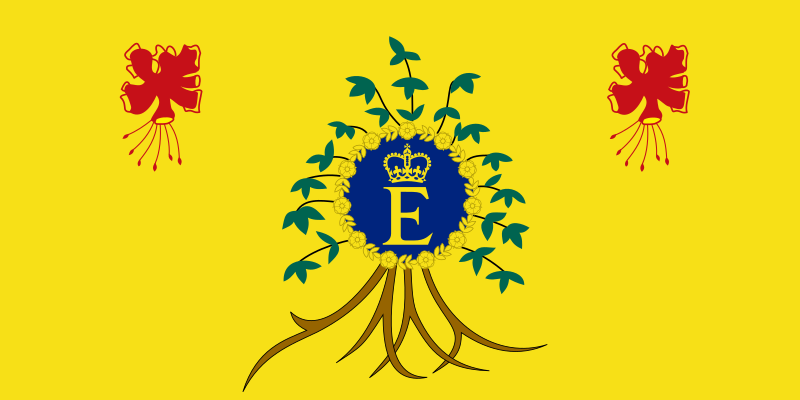 Approved for use in the 1970s, this flag is only used by the Queen in very limited circumstances- when she's in Barbados or attending an event abroad in her role as the head of state of Barbados. Her representative, the Governor-General of Barbados as his own flag. I really dig this flag, actually. It's simple, striking and it's kind of got a Cthulu/Octopi thing going on with the bearded fig tree in the center of the flag. The other royal standards (Canada, New Zealand, Australia, the UK) are more armorial- if that's the right word- heraldric? They're more old school- but Barbados breaks the mold quite nicely. As I mentioned already, the center of the flag features a bearded fig tree- a symbol of the island of Barbados. The national flowers are in the corners of the yellow field- they're actually called 'The Pride of Barbados' flowers, which is on point. The blue disc of the letter 'E' crowned by a garland of the gold roses in the center- it's taken from Queen's Personal Flag. I think this is a great way to end our Brown Flag Challenge. The brown in the flag- obviously, is from the roots of the bearded fig. It's got a striking and unusual design- it's outside the box for the Royal Standards, which is cool. Plus, I like how exclusive it is. The Queen only uses this flag when she's in Barbados or doing something in her role as Queen of Barbados- so this isn't a flag you see every day. Next week, I'll declare a winner of the Brown Flag Challenge (and award silver and bronze medals well) so until them, remember to keep your flags flying- FREAK or otherwise!